The bands of sheep flow across the landscape like foaming water, following wobbling traces etched into the bare earth. They’re hemmed in by men on horseback who greet a surprise visitor with “Salaam” in their native tongue—Azeri herders who, if not for the cigarettes, cell phones, and blue jeans, cut the same figure as their forebears who led similar flocks across these hills thousands of years ago. 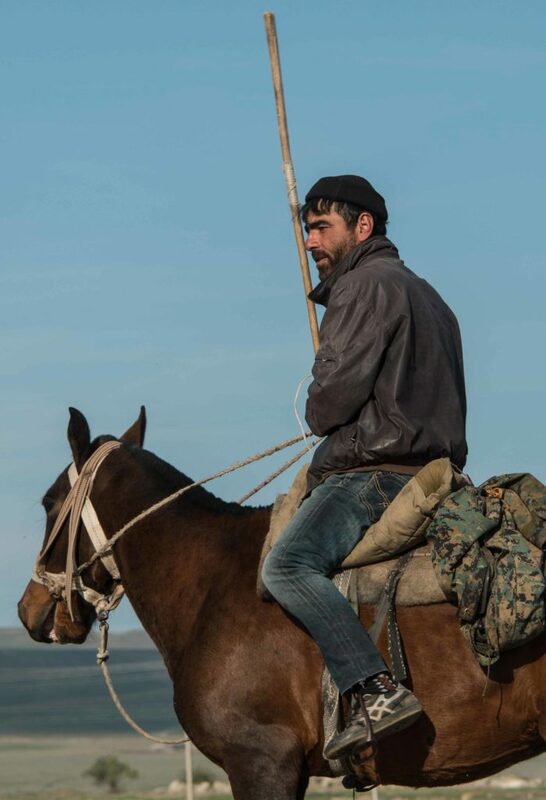 One of the herders trots his mount over and slings his leather whip over his shoulder. He explains in Russian to a visitor that the 1,500 sheep departed yesterday on a five-day journey across eastern Georgia to the village of Dedoplistskaro, near the border with Azerbaijan, where they will enjoy lowland pasture for the winter. Behind the sheep, short-muzzled donkeys carry camping and cooking gear for the herders. They trudge noisily with a few dozen native Georgian cattle, a short-horned, brown multi-purpose breed that seems as old as the hills around them. Like many of the herders escorting the sheep, this man is an Azeri, a western Asian people legendary for their horsemanship. Shadows are getting long and the sheep are starting to nibble at the thin stands of grass along their route, dusting the hills like a flurry of green snow. The herdsmen are starting to look for a place to camp for the night on one of about 40 parcels around the country that the Georgian government has designated for stop-overs. Looking West. The Azeris are an artist’s rendering of timeless western Asian culture, skilled Muslim horsemen from a nation of highlanders and valley-dwelling tribes. By contrast—though its capital, Tbilisi is due north of Baghdad—Georgia looks resolutely west, to Europe. One of the first countries on earth to adopt Christianity as its state religion early in the fourth century, Georgia spent centuries as Russia’s outpost below the Caucasus Mountains. After the collapse of the Soviet Union in the early 1990s, Georgia emerged as a fiercely independent republic eager to join NATO and the European Union (EU). That’s been a long road, but one of a handful of products Georgian agriculture can export to Europe is wool. In fact, wool is the country’s number-one agricultural export to the EU, ahead of honey and wine. Beka Gonashvili, head of the Shepherd’s Association of Georgia, says the country is home to about 1 million sheep, most owned in small bands of a few dozen. 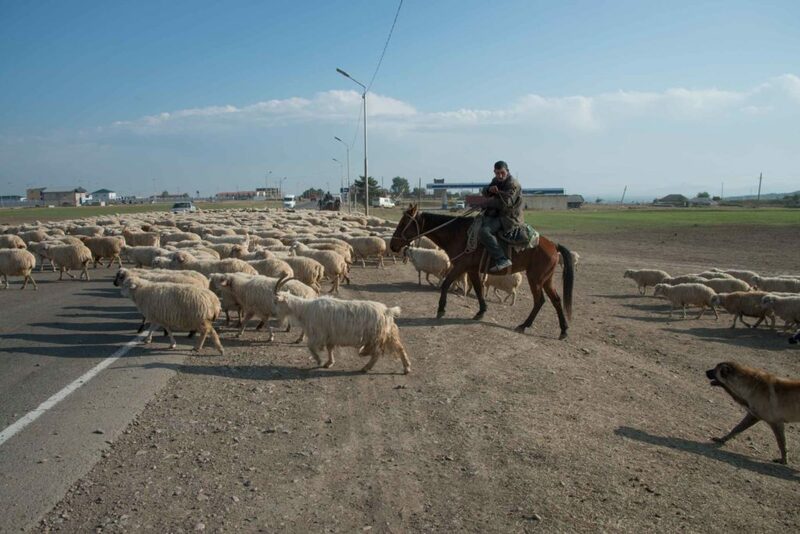 Herders usher sheep across a highway near the industrial city of Rustavi in the Republic of Georgia. His family is one of a handful of large sheep operators: he owns 5,000 Tushetian ewes, another 1,000 female replacement lambs, 300 curved-horned rams, a herd of cattle and an assortment of donkeys, horses, and guard dogs. Herders harvest his flock’s wool in spring and fall with mechanical shears, though Gonashvili figures 95 percent of Georgia’s sheep are sheared by hand. Pulled East. Though Georgia’s sights are set on European wool markets, economic realities pull them to the Middle Eastern markets that surround them. Farm-gate prices of $2.75 per pound for meat offset the losing deal on wool, he notes. Herdsmen supplement their wages by making cheese in the mountains from ewe milk. Looking Ahead. While his sheep travel to Dedoplistskaro with his neighbors’ flocks, Gonashvili is heading to Italy for a livestock trade show. He is hungry for insight into modern sheep production techniques and technologies, which is says are vital to advancing Georgia’s industry. 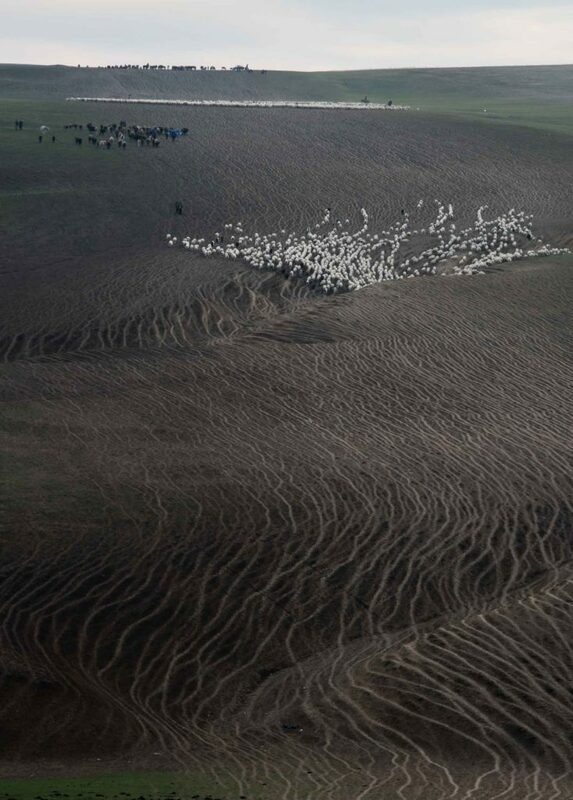 Sheep follow timeless trails across the landscape of southern Georgia on their way to winter pasture near Azerbaijan. “We don’t have modern technology here,” he says. “We don’t have ultrasound to detect mothers with twins so we can give them more feeding and more attention. We’re still milking by hand.” He looked for textbooks in Georgian and came up with Russian guides from the 1960s and ‘70s. Educated as a lawyer, Gonashvili is just one of Georgia’s ambitious young farmers, dedicated to building his nation’s agricultural system. MOLI in Kakheti (Market Opportunities for Livelihood Improvement), funded by the Swiss government, targets small owners of cattle and pigs in the eastern part of the country, promoting better feed, breeding and veterinary practices and encouraging small and medium-sized processors like cheese manufacturers and slaughterhouses to create higher-value outlets for livestock products. In other sectors, programs funded by the U.S. Department of Agriculture and the U.S. Agency for International Development help farmers with programs like Restoring Efficiency to Agriculture Production (REAP), ZRDA (which means “growth” in Georgian), and the Georgia Hazelnut Improvement Program. Meanwhile, as Georgia modernizes its agriculture, its ancient breeds of sheep keep flowing in waves across the hills like an endless tide, following the seasons and the traces on the earth as they have for thousands of years. Watch future issues of The Furrow for more stories from the Republic of Georgia. Changing to accommodate the next generation of ranchers. California's Agriculture Museum tells old stories in new ways.